Show your WING LOVE and become a member of the WingHouse Rewards club. It’s easy, just JOIN, VISIT and GET REWARDED! WingHouse Rewards is our way of thanking you for being a loyal WingHouse customer! As a WingHouse Rewards member, you will receive exclusive offers, news and promotions from your favorite WingHouse location. You’ll also receive 25 BONUS points just for signing up! Enter your card number and registration code (found on the back of your rewards card). Next, enter the required information and click SUBMIT. After you have submitted your information, you will receive a welcome email with your account information and current WH Rewards balance. *Please note that a physical card will not be provided when signing up using this method. You will provide the server with the phone number you signed up with in order to earn and redeem points. Does it cost anything to become a WH Rewards Member? No. There is no charge for becoming a WH Rewards Member. When do I get my 25 bonus points? After you register your card, your 25 bonus points will be added to your account automatically. You can access your account online at any time by visiting your member login page here. You earn (1) point for every one (1) dollar you spend on food, beverages, and merchandise. Reward Points will not be earned for any taxes, gratuities, donations, fees or delivery charges paid, or for the purchase of gift cards, or for purchases made using WingHouse Bar + Grill gift cards. If you have a physical card, you may present it to your server for them to. If you do not have your card, your server can look up your rewards account using the phone number you provided when you registered your card. Is there anything I don’t earn points on? Reward Points will not be earned for any taxes, gratuities, donations, fees or delivery charges paid, or for the purchase of gift cards, or for purchases made using WingHouse Bar + Grill gift cards. Reward Points are not earned for any transaction or purchase made through our Websites, or made through a third-party service provider, including without limitation online ordering and delivery services. I forgot to give my server my phone number or physical card. Can I still get my points? Please make sure you inform your server that you are a rewards member before your check is closed at the restaurant. Adding points after you have left the restaurant is not always possible. We may be able to add points for a missed check to your account if you take a clear, legible photo of both your itemized and payment receipts and email that photo with your contact information (name, email address & phone number) to rewards@winghouse.com. We MUST have BOTH receipts to verify your account. We will look up your account and apply rewards points if applicable. When will I get my WH Reward(s)? When you have earned 100 points on your loyalty card, a $10 WH Reward will automatically be loaded in your account for use on your NEXT visit. 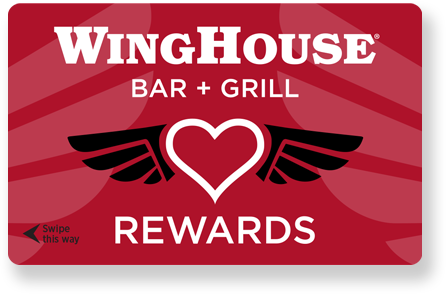 Can I use WH Rewards at any WingHouse location? Yes, you may redeem and earn points at any WingHouse location. Can I get WH Rewards if I don’t go online and register my card/account? If your card is not registered, you can still earn points. However, if you do not register your card, your points will not convert to rewards. Do my WH Rewards expire? Each Reward expires ninety (90) days from the day it is awarded. Other rewards and benefits may expire as indicated on the Reward. Is my WH Reward points automatically applied to my check? No. You must inform your server if you would like to use your reward. Your reward must be redeemed within 90 days from the time that you originally earned the reward. Rewards passing the 90-day mark will expire and will not be reissued. Can I redeem more than one WH Reward at a time? Yes. You may redeem any reward you have available on your account at the time of lookup. Can I use a coupon and a WH Reward on the same check? Yes, but you will only receive points for the discounted, final amount on your check.